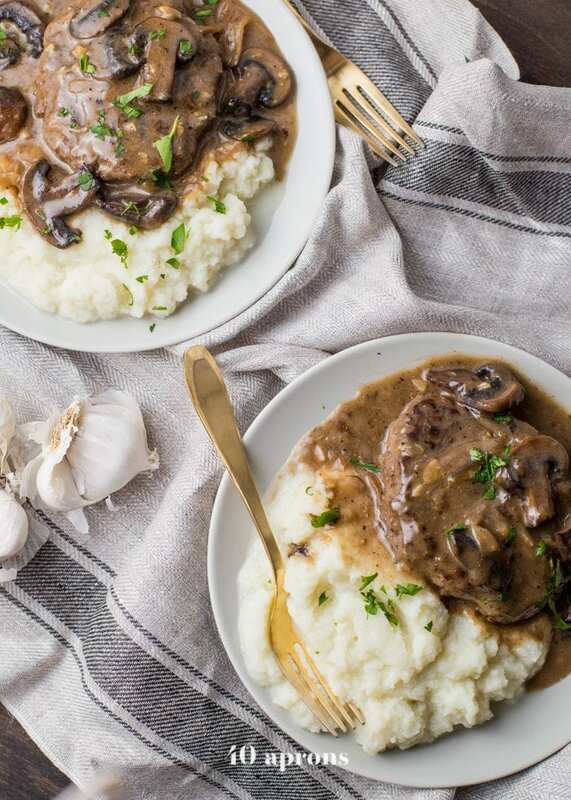 This Whole30 Salisbury Steak recipe is a healthy spin on a comfort food classic. 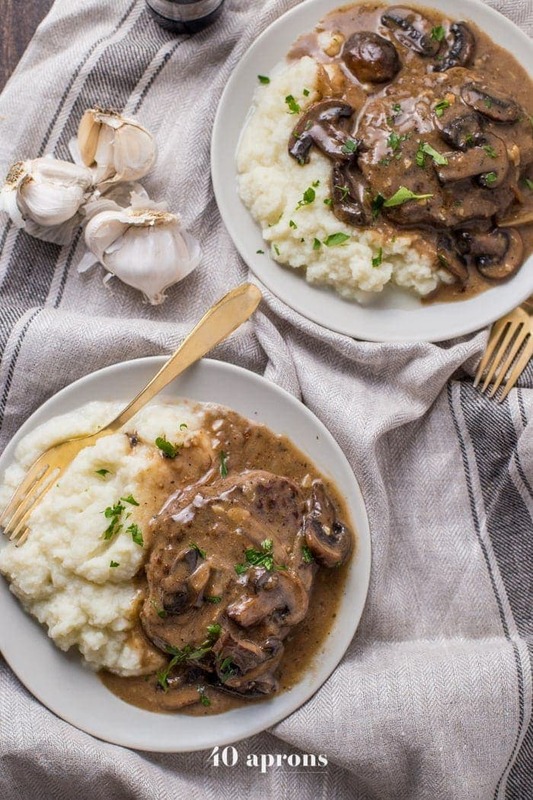 Tender beef patties smothered with a homemade mushroom gravy ready in just 30 minutes! 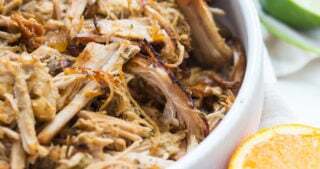 Serve this easy, paleo dish over mashed potatoes or mashed cauliflower! As the days get colder outside, there is nothing better than getting cozy at home with a plate of your favorite comfort food. For me, this Whole30 Salisbury Steak is one of the comfort foods I crave on a cold November day. And I am not talking about the TV Dinner kinda Salisbury Steak you’ll typically find in the freezer section of your grocery store. I am talking about a homemade, tender beef patty smothered with a rich mushroom gravy. 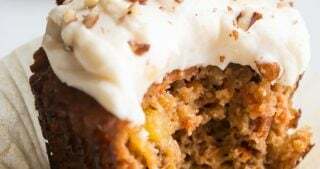 Homey, comforting and filling! Now, you hear “filling” and a little alarm bell goes off in the back of your head. 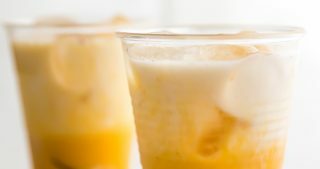 The thing is; filling does not have to mean heavy. Certainly, it’s all about choosing the right kind of filler, and lean beef paired with a homemade mushroom gravy is definitely the right kind. This Whole30 Salisbury Steak is an easy, Whole30 ground beef recipe for the whole family. This healthy Whole30 Salisbury Steak recipe can be whipped up within 30 minutes and only requires a skillet. Anchovy paste serves as a flavor amplifier and takes the mushroom gravy to the next level. 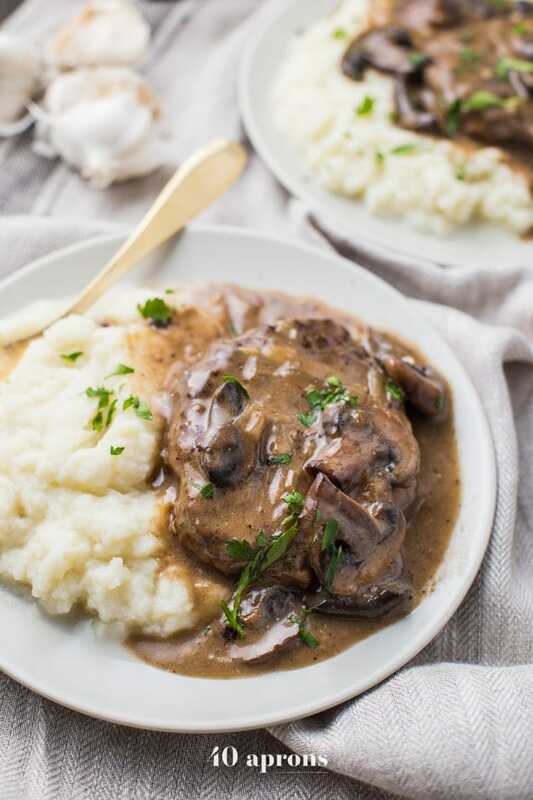 The combination of tender, juicy beef patties with a rich and creamy mushroom gravy makes this easy Whole30 Salisbury Steak a satisfying yet healthy meal. Returning the beef patties to the mushroom gravy allows for all the flavors from the mushroom gravy to simmer into the meat. When peeling the garlic, use this simple trick: lay the garlic clove flat-side down on your cutting board with the curved side up. Take your chef’s knife, and with one hand holding the knife handle, lay the flat side of the blade on top of the garlic clove. Quickly smash the side of the blade against the garlic clove. The outer skin will slide off the clove, and you now have a perfectly peeled clove ready for mincing. Ground beef should be cooked to an internal temperature of 160°F. Note that color is not always a reliable indicator for doneness, so you might want to use an instant-read thermometer. 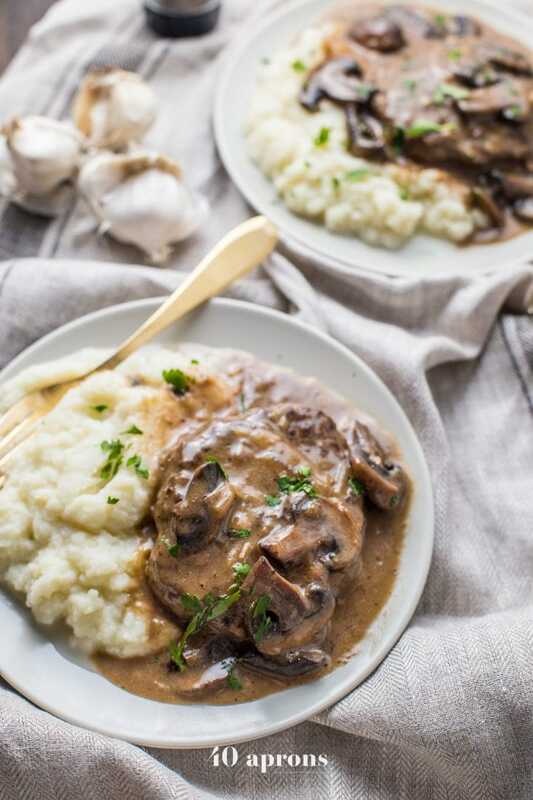 Serve this Easy Whole30 Salisbury Steak with mashed potatoes or my creamy cauliflower grits for a healthy low carb dinner. 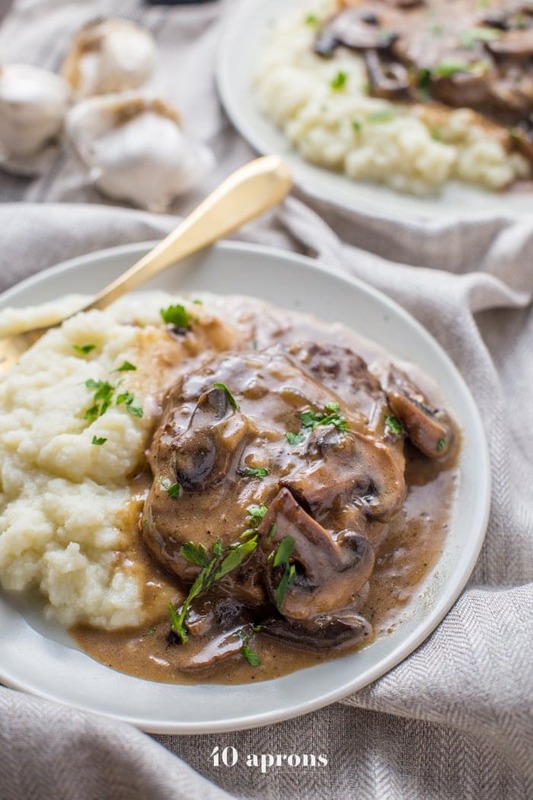 For an extra-rich gravy, add a tablespoon of cold coconut cream to the mushroom gravy right in the end. You can use anchovy fillets instead of anchovy paste and mash it into a paste-like consistency with a fork. Use 1 fillet for ½ tsp paste. 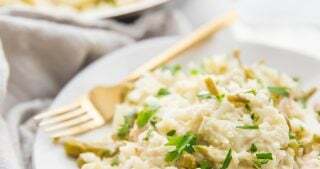 The canned fish contains oil and tastes saltier than paste so make sure to balance the saltiness with other ingredients. I bought anchovy paste for this Whole30 Salisbury Steak recipe and now I have no idea what else to use it for. Leftover anchovy paste can be used to incorporate more salty, savory flavor into dishes and can take them from flat to stellar. 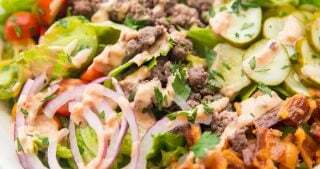 My Whole30 Caesar salad dressing and pasta sauces (think puttanesca) are great options, but it also works really well with most salad dressings and sauces. Can I make my burger patties from scratch? Absolutely! 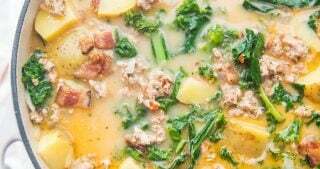 For this Whole30 ground beef recipe, you can buy ground beef and season it at home. 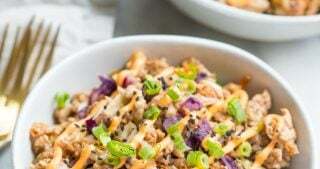 Put the ground beef in a bowl. Lightly break up the meat with your hands and sprinkle it evenly with some salt. Find a lid that is slightly bigger than the size of a hamburger bun. Cover the lid in plastic wrap and place a handful of ground beef inside the lid. Press the meat neatly into the lid, then remove any excess meat. Remove your burger patty from the lid and continue to make as many patties as needed. The more you handle it, the denser and more rubbery your Whole30 Salisbury Steak will become when cooked. First, heat ghee in a large skillet, preferably cast iron, over medium heat. Then add the beef burgers and cook them until perfectly done, about 3-6 minutes per side. Fresh burgers will need about 3 minutes per side, frozen burgers will need about 5-6 minutes per side. Transfer the cooked burgers to a plate. Add the sliced onions to the pan and sauté them until translucent, about 5 minutes. Toss in the mushrooms and fry them until they start to soften. Stir in the minced garlic and a little more ghee or oil, if needed. Cook this mixture, stirring constantly, until fragrant, for about 30 seconds. Now, stir in the anchovy paste – if using – and tapioca flour and whisk until smooth. Slowly add the heated beef broth, whisking constantly, and bring the mushroom gravy to a boil. Reduce the heat to a low simmer. 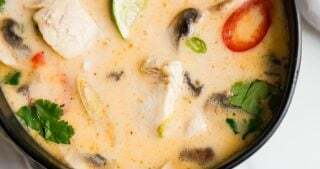 Finish up the mushroom gravy by whisking in the coconut milk, garlic powder, onion powder, black pepper, and salt and stir well. 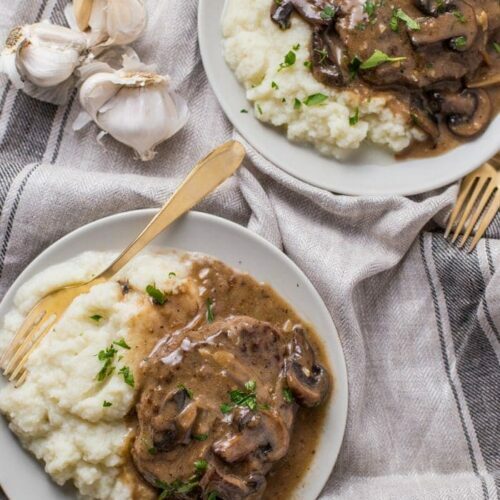 Return the beef patties to the mushroom gravy and let it simmer for a couple of minutes, then serve your Whole30 Salisbury Steak over mashed potatoes or cauliflower grits. Heat ghee in a large skillet, preferably cast iron, over medium heat. Add burgers and cook until cooked through, about 3-6 minutes per side. Fresh burgers will need about 3 minutes per side; frozen burgers will need about 5-6 minutes per side. Transfer to a plate. Add onions and sauté until translucent, about 5 minutes. Add mushrooms and sauté until they start to soften. Add garlic and a little more ghee or oil, if needed. Cook, stirring constantly, until fragrant, about 30 seconds. Add anchovy paste, if using, and tapioca flour. Whisk until smooth. Slowly add beef broth, whisking constantly, and bring to a boil. Reduce heat to a simmer. Whisk in coconut milk, garlic powder, onion powder, black pepper, and salt; stir well. Return patties to gravy and simmer a couple minutes, then serve over mashed potatoes or cauliflower. 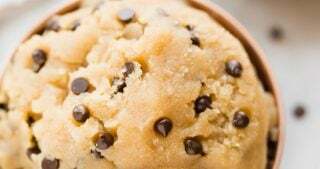 I made this recipe exactly as noted and it was super good! Both my husband and I enjoyed it! Would a complaint fish sauce, like Red Boat, be a substitute for the anchovy paste? I have a big bottle of that on hand and was wondering if I should still buy the anchovy paste and use that instead? The fish sauce would definitely add some umami flavor, but I would definitely grab some anchovy paste! You’ll fall in love with the amazing umami it adds, and I think it makes a big difference here! I can’t even express to you how good this is. 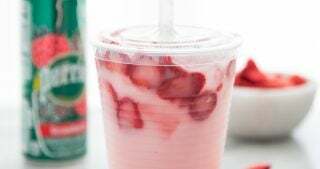 It doesn’t taste like a substitute version of it’s less healthy standard version – if anything it’s even better this way. I didn’t use the anchovy paste and it was still delicious.